If you're a regular at online casinos and if you've ever thought that most casino bonuses are geared for new players, not frequent players, check out the new Bet-at.eu. It's a new online casino designed with frequent players in mind with features like customizable bonuses. With nearly 200 no-download Chartwell casino games and many more soon to be added, Bet-at.eu offers an incredible selection of state-of-the-art online casino games. Although Bet-at.eu is new its management team brings many years of casino operations and customer support experience to the new company. Bet-at.eu offers a fully customizable bonus program that enables active players to choose bonus options that match their playing habits and maximize their rewards. For example, the “Starter” package is for new players making small deposits whilst players that usually make deposits over €50 can choose the “Mid-Roller” bonus package and get a bigger match bonus on their first deposit. Those that tend to make larger deposits might prefer the “Platinum” bonus package which has a lower wagering requirement. 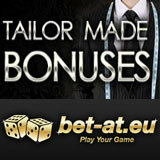 It also gives a massive First Deposit Bonus up to $1500 and a bigger match bonus on the third deposit of the month. Many players play only slot machines so choose the “Slots” bonus package which gives a 150% first deposit bonus and larger bonuses on smaller deposits. Most importantly, if none of these bonus combinations is perfect for them, players can also mix and match benefits to create their own individual bonus program. The jackpot pool at Bet-at.eu is currently over €360K. The largest progressive jackpot is the 3x Bonus Spin & Win slot machine which is currently over €258,000.